Remember the “good old days” in your ministry? This booklet provides a biblical basis to maintaining that vibrancy and commitment that accompanies any new move of God. Perhaps, as you’ve read through this booklet, you can identify with what I’ve shared. You recall the vibrancy and passion you shared with your fellow workers to reach the lost. You remember your enthusiasm to serve one another, the love and family atmosphere you enjoyed and the unity you experienced. But all those blessings you once enjoyed are now just a memory. Is there hope for your church, your organization? Absolutely. You can return to the original vision of your ministry. You can once again experience life and joy between you and your coworkers. I encourage you to determine in your heart to seek the Lord and listen for His voice. It is His life that will restore your ministry. It is His vision that will guide and direct you. This entry was posted in Principles in Maintaining a Godly Organization and tagged agency, belief, Bible, Christianity, church, Discipleship, encouragement, faith, gfa, God, Gospel for Asia, Him, holy spirit, Hope, Jesus Christ, K.P. Yohannan, Lord, ministry, Missions, organization, parachurch, service on September 30, 2010 by gfaseo. This entry was posted in Principles in Maintaining a Godly Organization and tagged agency, Bible, Christianity, church, Discipleship, gfa, God, Gospel for Asia, Him, holy spirit, Hope, Jesus, Jesus Christ, K.P. Yohannan, ministry, Missions, organization, parachurch, service on September 28, 2010 by gfaseo. 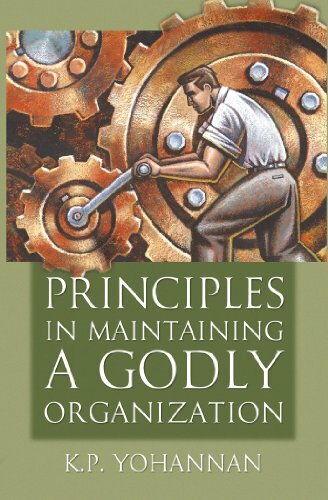 This entry was posted in Principles in Maintaining a Godly Organization and tagged agency, Bible, Christian, Christianity, church, encouragement, gfa, Gospel for Asia, Jesus, K.P. Yohannan, ministry, Missions, organization, parachurch, principles, service on September 23, 2010 by gfaseo. This entry was posted in Principles in Maintaining a Godly Organization and tagged agency, Bible, Christian, Christianity, church, encouragement, gfa, God, Gospel for Asia, Him, holy spirit, Hope, Jesus, Jesus Christ, K.P. Yohannan, Missionaries, Missions, organization, parachurch, service on September 21, 2010 by gfaseo. This entry was posted in Principles in Maintaining a Godly Organization and tagged agency, belief, Bible, Christian, Christianity, church, Discipleship, encouragement, faith, gfa, God, Gospel for Asia, Him, holy spirit, Hope, Jesus, K.P. Yohannan, ministry, Missionaries, Missions, organization, parachurch, service on September 16, 2010 by gfaseo. What I share in this booklet I have learned over the past couple decades of experience with Gospel for Asia. I pray that you will take the time to think deeply about what you will be reading and learning. Let your understanding and response go beyond your intellect or your emotions. This entry was posted in Principles in Maintaining a Godly Organization and tagged agency, belief, Bible, Christianity, church, encouragement, faith, gfa, Gospel for Asia, holy spirit, Hope, Jesus, Jesus Christ, K.P. Yohannan, Lord, ministry, Missions, organization, parachurch, service on September 14, 2010 by gfaseo.